“Italians do it better” by Pret a Diner launched in Mayfair last week with a bang. Though the invite did not say so, the dress code was definitely Italian chic: think Dolce & Gabbana with added stars and sparkles – the likes of Chris Eubank and Zafar Rushdie came along for the bash. With Giorgio Locatelli at the helm sending out plates of delicious Italian in the restaurant, created by him and five other Michelin-starred Italian chefs, the food was positively nourishing. 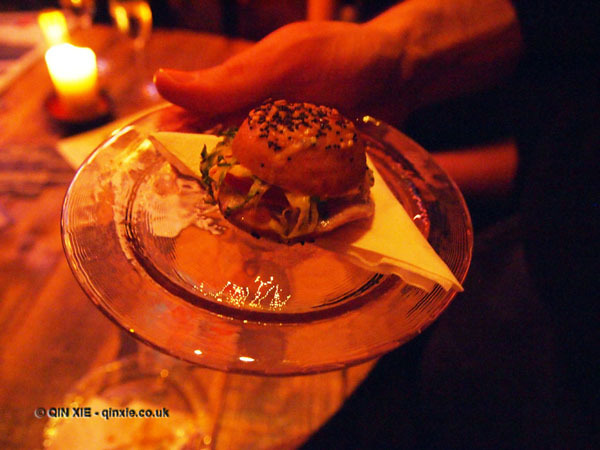 The canapés sent round ran along the lines of mini-burgers, pasta and scallops just to name a few. Fashionistas might worry about the calories but you’ll definitely be in need of some carbs after sipping the potently easy drinking cocktails at the bar run by 69 Colebrooke Row. Cocktails aside, Moët & Chandon flowed alongside Martini Royales making grooving to the beats of the DJs a whole lot smoother. There’s rumours of there being some 14 floors in the building and more bar space than you can shake a stick at. Well, there is definitely a gallery, an all-Italian restaurant and a few bars along side space for live music.